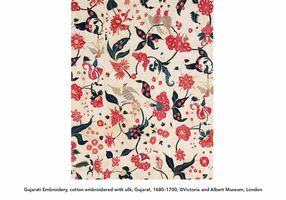 Organized by the prestigious Victoria and Albert Museum in London, this exhibition is the first to fully explore the dynamic and multifaceted world of handmade textiles from India. The exhibition showcases the finest examples from the V&A’s world-renowned collection together with masterpieces from international partners, leading designers, and additions from the Cincinnati Art Museum’s own outstanding permanent collection. Visitors will have the opportunity to explore a stunning range of historic dress, heirloom fabrics, and cutting-edge fashion. India’s handmade textiles are embedded in every aspect of its identity and the history of these fabrics date back at least 6000 years. The oldest surviving cotton threads, from around 4000 BCE, were exported from India. Dyed textiles from the region are documented as far back as 2500 BCE. Textiles are so central to India’s identity that in ancient Greece and Babylon the very name ‘India’ was shorthand for ‘cotton’. The six thematic sections will explore courtly splendor that was proclaimed by sumptuous fabrics, while religious worship found expression through finely crafted sacred cloths. Centuries of global trade shaped by the export of Indian textiles exemplify the robust aesthetic exchange engaged in by artisans who reflected the culture of their clients in their work. India’s celebrated textiles survived the threat of industrialization and were used to unite India as a symbol of power and protest in the quest for independence in the early twentieth century. Today, Indian designers are adapting traditional techniques to create exciting new fashion, art and design for a global audience, giving India’s textile history a new relevance in the modern world.